Wait, Trump is Hanging Out with Thugs? Donald Trump is inciting violence, right? He is but the media's obsessed with it and all the blame is going one way. 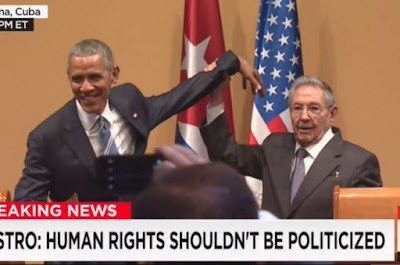 But the media seems unconcerned with the violence being done on those who publicly disagree with Raul Castro in Cuba. Reports indicate that Castro has many political prisoners. You think pictures like this will encourage those opposing Castro and who support freedom or the thuggish dictator? Caption this limp wristed diplomacy.